Aly's Angle: Herbal Tea I have traveled around the world, and enjoying a cup of tea seems to be a tradition across cultural boundaries. In Kenya they drink chai tea, in Peru coca tea (which is illegal in the U.S.), and in Europe they drink their tea in fancy cafes. Whenever I return from my travels, I envision a life where I wake up early and enjoy a hot cup of tea before I start the day. This week, every morning I did exactly that for the #bebetter52 challenge. Due to religious reasons, I am limited to herbal teas (yes, I am Mormon), and have always felt that my herbal tea options were limited. It wasn't until recently that I realized, it isn't the caffeine, it is the leaf Camellia sinensis which makes up black, green and white tea. Any tea that does not include this leaf is considered herbal. So now I am super excited about trying different combinations of herbal tea. My friend recently introduced me to a caffeinated herbal tea called yerba maté. This feels almost "life changing," because sometimes it’s just nice to have a little caffeine in my bloodstream. Without the option of coffee and tea, I was limited to soda, which I knew wasn't healthy. So this week I have been drinking yerba maté, which doesn't make me feel jittery or make me crash hard after I drink it. My younger sister Maddie kick-started my interest in learning more about herbal teas. She totally inspired me this Christmas because she gave me an adorable glass jar full of loose leaf tea meant to help with fertility. Yes, my husband and I want to have a baby. It wasn’t just the adorable support my sister gave my "baby making" goal, but also that she was so thoughtful about giving a gift that was good for my health and incredibly creative. In addition to the gift she gave me the "Mr. 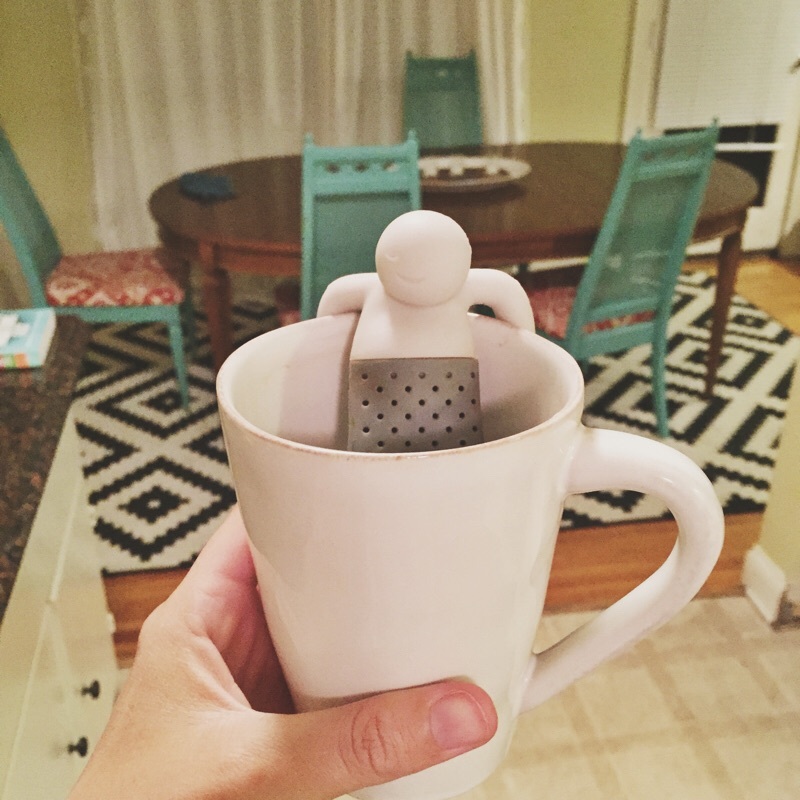 Tea Infuser," which looks like a man chilling out in a hot tub. But instead he is a tea bag propped at the side of a hot cup of tea. It was perfect timing because a week before this challenge I was visiting my family in the Northwest. Maddie took me to The Herb Shoppe in Portland. This was my first time in a loose leaf herb shop, and now I am obsessed. The shop has shelves full of tea combinations to heal dozen, or maybe hundreds, of ailments. So after thoughtful consideration, I bought two bags of tea for $5 each. One is for head cold relief and the other is for morning sickness for the future. I am scared to death of morning sickness and, based on my sisters’ experience, there’s a genetic tendency. Now, hopefully, I am prepared. I hope everyone enjoyed this week’s Be Better challenge to drink herbal tea in the morning. For me it was the exact amount of push I needed to fulfill my dream about coming home from my travels and waking up early to enjoy tea in the morning.